The most fun custom gift basket we created this week was delivered to the set of Glee for Kevin McHale who plays Artie on the show. 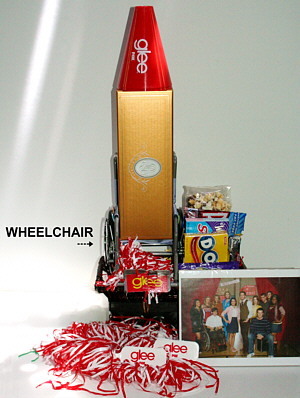 Our client had the small wheelchair, Glee megaphones and cheerleader pompoms. What happened next you can see here. The Cristal champagne is sitting in the wheelchair that has Artie’s picture on it. The rest is strictly high school (or is it high camp? ), containing lots of high-schoolish candies and snacks to set the right tone. Gift basket projects like this keep things very fresh and lively here at Fancifull. Do you have a challenge for us? Maybe yours will be featured here as gift basket of the week!